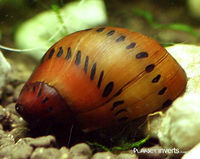 Nerites are not hermaphrodites, their are separate sexes of male and female snails. It will lay eggs in freshwater, but they won't survive since the young need brackish conditions to live. Needs a spacious well oxygenated tank with plenty of algae to eat. If put in a new tank with no algae present and not supplemented, it can starve. A tight fitting lid is a must as these snails can be escape artists. must have water with a pH of greater than 7 and GH of greater than 5°d otherwise the shell will dissolve away and the snail will die. The presence of copper in the water will kill it. An attractive snail that will not multiply. They may lay lots of white/yellow eggs however, but they will not hatch. The young need brackish, or saltwater conditions, due to the fact that the larvae need calcium, and minerals to build up their shell; for this reason, you will have the most success rearing them in full-strength marine, and the adults can call brackish, and marine setups home. The eggs harden and can be difficult to remove. This snail is a gill breather.